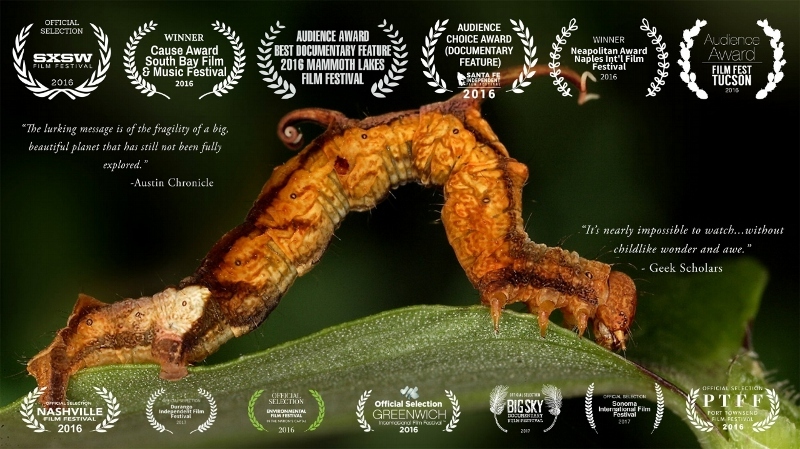 If you judge a movie by its cover, Jake Oelman's Learning to See: The World of Insects (2016) looks like a standard nature documentary about...well, bugs. Yet the write-up and short text introduction reveals a more personal film: it's about Jake's father Robert, who became dissatisfied with his career as a psychoanalyst and, in the early 1990s, moved to Columbia -- the South American republic, not the city -- after reading Love in the Time of Cholera. 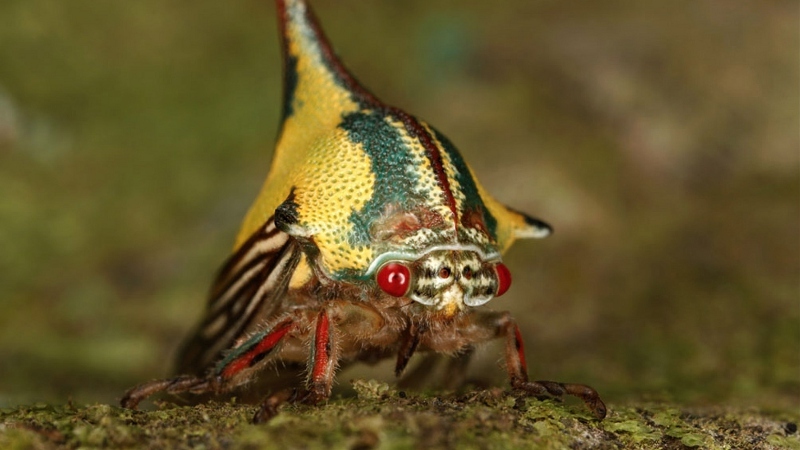 After purchasing a hillside home and surrounding farmland for roughly $40,000, he befriended a local family and took up macro photography. 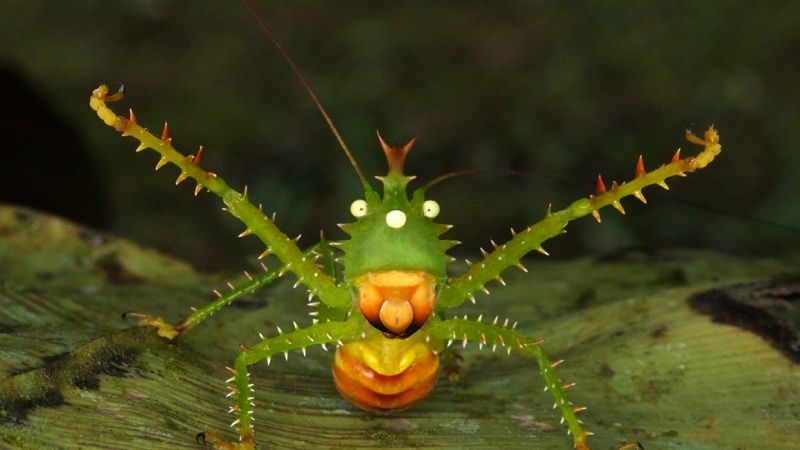 This eventually led to capturing detailed photos of exotic and rarely-seen insects with one family member, Christian Gomez, serving as his sharp-eyed assistant. After more than a decade of focused, life-consuming work in locations including remote areas of the Amazon rainforest, Robert returned to the United States for a showing of his work at a NYC art gallery. It's an interesting timeline on paper, and one that promises a satisfying, circular journey of finding true happiness in life. Frustratingly, Learning to See has trouble maintaining interest beyond showing Robert at work in South America, with the first and most obvious being its extremely long-winded and dull introduction. Robert's insights about anything other than photography aren't very...well, insightful, whether it's psychology or his views on American friendship. By the time it really gets going, Learning to See serves up lots of impressive visuals and Robert's successful NYC show carries a welcome amount of closure. Yet the photographer's obvious discomfort in front of crowds and difficulty with public speaking remind us that he's more at home behind a macro lens. Had Learning to See likewise omitted Robert's on-camera interviews and the dull pre-Columbian introduction, it would've been a much more consistently engaging documentary. If it seems like I'm being too tough on what's otherwise a thoughtful and interesting film, consider this: Learning to See barely exceeds a 65-minute running time, doesn't turn its attention to Robert's full-time Columbian photography until after the quarter-hour mark, and there's more than six minutes of credits. That doesn't leave much room for the good stuff, and as a whole makes Learning to See feel extremely padded. Although this successful Kickstarter project was obviously a labor of love from son to father, I sincerely feel it would've been more interesting if a few non-family members were able to rein in the focus a bit. FilmRise presents Learning to See on Blu-ray and gives the brief main feature a decent amount of support, including an excellent 1080p transfer and a few short but enjoyable bonus features. Presented in its original 1.78:1 aspect ratio, this 1080p transfer of Learning to See looks as about good as expected for a recent digitally-shot documentary. As much of this footage is captured outdoors in well-lit areas, image detail is quite impressive at times with tight textures and excellent contrast. Nighttime and indoor scenes hold up nicely as well, with little loss of detail in even the darkest areas. 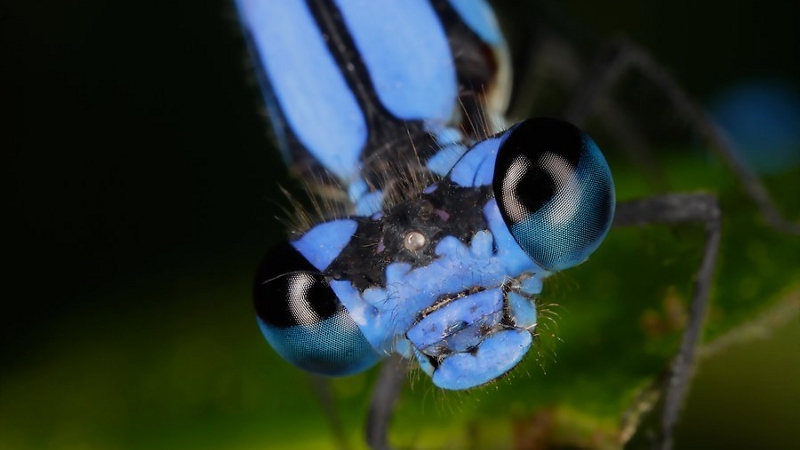 Color saturation appears smooth and natural (and quite bold at times, especially when those exotic insects are on display) with no bleeding, and skin tones are accurate as well. The only slight technical problems -- and they're likely source material issues -- are trace amounts of banding, as well as a few brightness fluctuations when light levels change outdoors suddenly. A few bits and pieces of outdoor footage were also captured with lower-resolution equipment and, while they're obviously not quite as impressive, the transitions aren't all that jarring. Overall, this is a very strong presentation and I appreciate that a Blu-ray option was made available. DISCLAIMER: The screen captures on this page are do not necessarily represent the title under review. The audio is presented in DTS-HD Master Audio 5.1 Surround or 2.0 Stereo, with both options handling the source material quite well. Dialogue and front-channel effects are clear, with no apparent sync issues or other obvious defects. Surround activity is subtle but very much appreciated -- obviously there's going to be a lot of buzzing around at times, and other outdoor animals and weather effects can be clearly heard as well. Overall, this is an above-average effort that slightly surpasses what you'd expect from a documentary of this type -- at least from a design format. I've got to deduct at least a point for no lossless audio option, as it should be mandatory for Blu-ray releases. Optional English (SDH) subtitles are included during the main feature, while most of the Spanish dialogue typically features burnt-in subs. FilmRise's basic interface features simple navigation with access to chapter selection, audio/subtitle setup, and extras. This one-disc package arrives in a standard keepcase with colorful artwork and no inserts of any kind. A few short but sweet extras are here as well -- not always the case with most documentaries. "The Making of Learning to See" (9 minutes) offers a quick overview and some candid footage of the family. On a related note are five Deleted Scenes ("Butterfly", "Caiman", "Hummingbirds", "Indigo", and "Ocelot", 12 minutes total) that detail a few photography subjects, as well as a collection of Panoramic Photography (6 minutes) by the Oelmans. Last but not least is a self-playing gallery of still photo Slides (7 minutes) and the film's Theatrical Trailer. Good stuff, especially for aspiring photographers. I wanted to enjoy Learning to See from start to finish: it seems like a thoughtful documentary with eye-popping images about an interesting subject, but the first leg of the film is painfully dull and several other stretches feel awfully padded. Even so, there's some great material here, especially the main portion that depicts photographer Robert Oelman hard at work in Columbia. But at just over 65 minutes in length (which includes almost six minutes of end credits) with maybe a half-hour of extras, this one's awfully light on content. Despite the Blu-ray's solid A/V presentation, I'd only recommend Learning to See if you're extremely interested in the subject matter. Otherwise, just Rent It instead.